Taipei, Taiwan, October 13, 2016 – QNAP® Systems, Inc. today released the powerful enterprise-class TES-x85U NAS series, including the 18-bay TES-1885U and the 30-bay TES-3085U. Both models are powered by a high-performance yet energy-saving Intel® Xeon® D processor, and provides the choice of dual OS inside a single rackmount NAS. Users can choose to install the business storage QES operating system or the app-centric QTS operating system based on their needs. The TES-x85U series with QES is the perfect backup storage for the dual-controller Enterprise ZFS NAS (ES1640dc). The 12Gb/s SAS-enabled TES-1885U and TES-3085U adopt an advanced 14nm Intel® Xeon® D 64-bit SoC processor with an integrated PCH (6-core and 8-core respectively). Both models have two built-in 10GbE SFP+ ports to natively support 10GbE network environments, and can further boost system performance with PCIe Gen.3 expansion for additional 10GbE/40GbE adapters and PCIe NVMe SSD. The high-density TES-3085U is especially useful for providing an ultra-fast all-flash storage solution that offers up to 24 drive bays and 6 dedicated SDDs bays for caching. The TES-x85U with QTS performs as an all-in-one NAS solution. QNAP’s Qtier Technology empowers the TES-x85U with Auto Tiering that helps continuously optimize storage efficiency across SSDs and SAS/SATA drives, providing utmost efficient storage center. A comprehensive disaster recovery solution is fulfilled by rich backup options including volume and LUN snapshots, RTRR, rsync and cloud storage backup. Users can create Windows®, Linux®, UNIX® and Android™ virtual machines for extensive applications on the NAS using Virtualization Station, or initiate LXC and Docker® containers and IoT development with Container Station. QTS provides services for diverse application servers (including a web server, VPN server, and FTP server), and the App Center includes hundreds of install-on-demand apps to expand NAS functionality (including Surveillance Station for security surveillance, Q’center for centrally managing multiple QNAP NAS, and more). The TES-x85U series is certified for VMware® vSphere™ 6.0 and supports VAAI, provides compatibility for Microsoft® Hyper-V® with the support for ODX and Windows Server® 2012, and supports Citrix® XenServer™ 6.0 to maximize flexible deployment and management in virtualization environments. 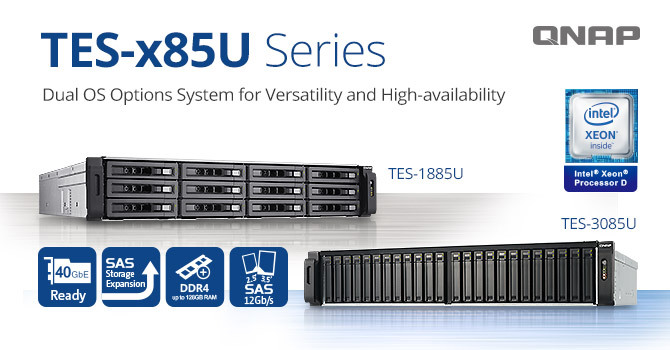 The TES-1885U NAS is now available; the TES-3085U NAS will be available in November. For more information, and to view the full QNAP NAS lineup, please visit www.qnap.com.